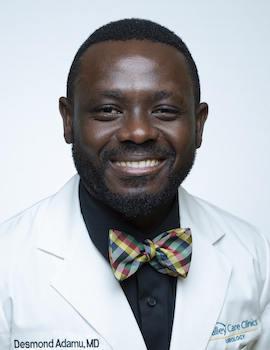 Dr. Adamu is a urologist who specializes in overactive bladder/urinary incontinence, prostate cancer, kidney stones and erectile dysfunction. He performs elective surgeries and in-office procedures and is trained in robotic surgery. Education: Meharry Medical College, Nashville, Tenn.
Training: Urology/Urologic Surgery Residency: University of Miami Miller School of Medicine, Miami, Fla.; General Surgery Internship: Jackson Memorial Hospital, Miami, Fla.